FS1 has defiantly set itself up as a target for critics and fans by embracing debate and brash, trollish personalities such as Colin Cowherd, Jason Whitlock and now, Skip Bayless. Tuesday morning at 9:30 a.m. ET — a half-hour earlier than originally advertised — Bayless’ new debate show, titled Skip and Shannon Undisputed, debuted. If there was any doubt that this was the Skip Bayless show, with former NFL tight end Shannon Sharpe and moderator Joy Taylor along for the ride, the opening four minutes left no doubt. Bayless was given the floor — his floor — to give a statement in which he lavished praise upon Lil’ Wayne for creating Undisputed‘s theme song (which is worth a brag), then virtually held up broken shackles as he pledged to give “all of me” to the audience. Bayless got emotional talking about his former wrestling partner, Stephen A. Smith, and his benefactor, FS1 overlord Jamie Horowitz. There was a lot of sighing. Finally, Bayless has his own showcase without the corporate specter of Disney looming overhead. Or a producer telling him to move the show along, apparently. Bayless eventually let Sharpe and Taylor make some opening remarks, which made for an awkward transition after what was basically an Academy Award acceptance speech. But hey, this was his moment. It’s easy to make fun of Bayless, especially when he’s acting like Jerry Maguire pouring out his heart to Dorothy Boyd. Yet he also welcomes the shots fired his way, sticking his chin out and daring his detractors to come at him. Better that than nobody talking about him or Undisputed at all. Not everyone would be suited for such a role, regardless of whether or not it actually sets the conversation for the day. Perhaps Undisputed should be called an endurance test instead. That’s not necessarily a crack at tolerating Bayless and a show format that’s been heavily criticized among those who cover and observe sports media. It’s more a comment on a two-and-a-half-hour run time. That’s a lot of television for anyone to watch in one sitting, which isn’t a ballgame or a movie. Maybe that’s the wrong way to look at this. Maybe each episode of Undisputed is meant to be a competitive exercise between Bayless and his new on-air sparring partner. Could it be that each daily 150-minute show should be viewed as a narrative during which Bayless and Sharpe attack each other right away, fiercely trading hot takes and disbelief until one participant yields or the two combatants decide they have reached common ground? Or this is just the latest sports show in which two guys yell at each other with a moderator occasionally stepping in to either change topics or throw to a commercial break. FS1 would surely love it if you did watch all two-and-a-half hours of the Skip and Shannon show, but execs and producers would likely admit that shows like this are not meant to engage the viewer for that long. They’re background noise, a distraction from tasks at home, workouts at the gym, or the wait for a flight. It’s akin to televised sports talk radio. The question is whether or not people tune in hoping to see something new or want a familiar personality on TV. If you watched the early segments of Undisputed, it probably didn’t look very different from First Take to you. That’s probably the idea, to a large extent. And you don’t hire Skip Bayless to be someone else. You know what you’re getting. So you get a discussion on Bayless’s beloved Dallas Cowboys and preseason phenom Dak Prescott. As you might guess, Bayless is enamored with the rookie quarterback, while Sharpe is skeptical of preseason performance meaning anything. Sharpe pointed out that Bayless would be equally doubtful of Prescott if he played for a team other than the Cowboys, but Bayless did not budge. Those familiar with the man’s work know that this might be his strength, but it’s also what makes him terribly infuriating to watch. And Sharpe was getting worked up. He’s accustomed to working with Bayless and knows what he’s dealing with. It’s also possible that Sharpe’s tension and frustration was increasing for the benefit of the show. Sports performance art? OK, you call it that. For Undisputed‘s debut, Sharpe surely needed to maintain a high level of outrage and exasperation. Especially when Bayless was in something of a contemplative mood, savoring his new show and a new opponent to troll. But I do wonder about the long-term health of the table at which Sharpe, Bayless and Taylor sit. That thing could be getting broken in two by the end of this week. Hopefully, FS1 has a good deal with a local furniture store, an on-site woodworker, or a table designed with a breakaway hinge in the middle of it. Sharpe got nearly as agitated when Bayless was defending Tim Tebow and his ambitions toward a baseball career. To Bayless, Tebow was crushing balls and running down everything hit to him in the outfield. It’s only a matter of time and the right organization before Tebow gets the opportunity that the NFL conspired to keep from him. That was ridiculous and just fed into the notion that Bayless worships Tebow. Unfortunately, Sharpe really couldn’t counter Bayless from a baseball standpoint, so the discussion devolved into a dissection of Tebow’s career with the Denver Broncos. Skip and Shannon Undisputed is exactly the show you think it is. That will either draw you in or instantly have you interested in something else— anything else. But if you didn’t like Skip Bayless, why would you be watching this show anyway? It’s an alternative to Stephen A. Smith and Max Kellerman on First Take, and maybe being on FS1 will allow Bayless and Sharpe to go further toward the edge than ESPN would have. There might be instances when compelling discussion might actually take place, as when Bayless appealed to Sharpe to give him proper perspective on Colin Kaepernick’s refusal to stand for the national anthem. But those moments figure to be rare unless the sports news cycle forces some level of thought and introspection. Undisputed isn’t the environment for that, but you already knew that. This is Skip Bayless unleashed, and we’ll all have to deal with it. Pingback: Can Jaime Horowitz & FS1 have their cake and eat it too? 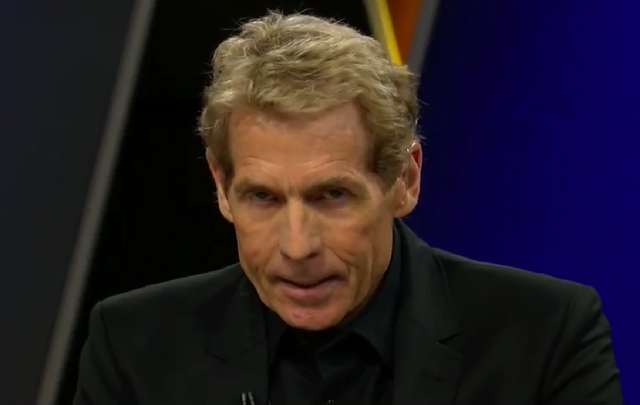 Pingback: TheWrap says Skip Bayless' debut both "drowns" and "soars"